Don’t Push the River, April 2016 Benaki Museum, Athens, AS ONE. Amanda Coogan is one of the most exciting contemporary Visual Artists practicing in the arena of Performance Art. She is at the forefront of some of the most exciting and prolific durational performances to date. Her extraordinary work is challenging, provocative and always visually stimulating. Her recent exhibition in the Dublin’s Royal Hibernian Academy was described by Artforum as ‘performance art at its best’. Using gesture and context she makes allegorical and poetic works that are multi-faceted, and challenge expected contexts. Her works encompass a multitude of media; Objects, Text, Moving and Still Image but all circulate around her live performances. Her expertise lies in her ability to condense an idea to its very essence and communicate it through her body. Time is a key material in Coogan’s live performances. 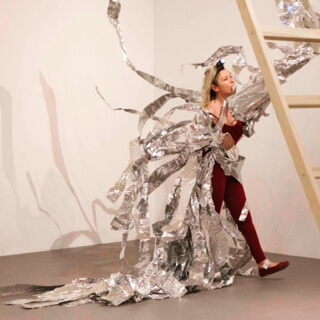 The long durational aspect of her live presentations invites elements of chaos with the unknown and unpredicted erupting dynamically through her live artworks. Her work often begins with her own body presenting both solo works and group performances. She was awarded the Allied Irish Bank’s Art prize in 2004. She has performed and exhibited her work extensively including; The Venice Biennale, Liverpool Biennial, PS1, New York, Galeria Safia, Barcelona, The Irish Museum of Modern Art, Limerick City Gallery of Art, Royal Hibernian Academy, Dublin, Van Gogh Museum, Amsterdam, The Museum of Fine Arts, Boston, Centre Culturel Irlandais, Paris and the Hugh Lane Gallery, Dublin. Coogan completed her doctoral thesis on live durational performance art in 2013 at the University of Ulster.